Trinity College football opened their 2018 season with a dominating 35-0 win over the Colby College Mules on an away match-up. 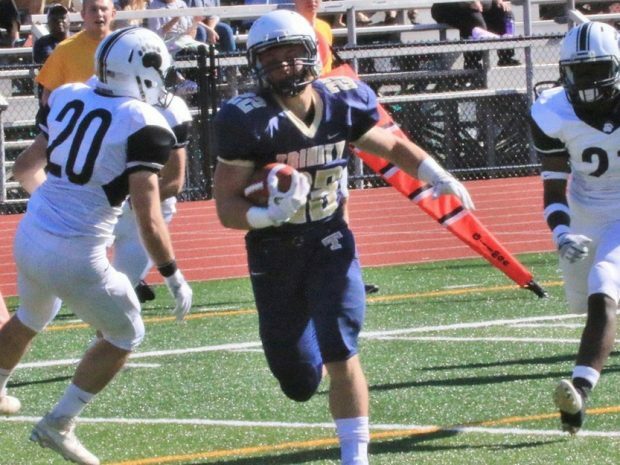 The Bantams’ strong offense took control of the ball throughout the entire game, with senior tri-captain running back Max Chipouras (Longmeadow, MA) rushed for 173 yards and three touchdowns, while sophomore wide-receiver Jonathon Girard (Poughkeepsie, NY) recorded 166 receiving yards and two touchdowns. Chipouras scored first for the Bantams with 9:19 left in the opening quarter on a four-yard run. The Bantams drove the ball 94 yards on eight plays, with fake punt yielding a big play. Junior punter Ian McDonald (Avon, CT) had a 19-yard pass completion to sophomore Dakota Foster (Hyattsville, MD) to keep Trinity’s drive alive and continue to the end zone. For the majority of the first quarter, Trinity’s offense was on the field. After a towering 42-yard boot from Colby, putting the Bantams on their own three-yard line, Girard received a pass by the left sideline from junior quarterback Jordan Vazzano (Trumbull, CT) and ran 97 yards to the end zone–extending the lead to 14-0. In the second quarter, the Mules caused a turnover on their own 34-yard line and left an opportunity for the Bantams to score once again. The Bantams took advantage. On a third-and-nine play, Vazzano connected with Girard once again and scored. Before the half, the Bantams kept the pedal-to-the-metal with their offense. On the fourth Bantam touchdown of the game, senior Chipouras ran the ball seven times and finally, on a fourth-and-goal try, he put Trinity up 28-0 on the Mules. The put a cap on the half, Chipouras once again delivered and scored on a 64-yard run with 3:11 left in the half. By halftime, the Bantams led the Mules 35-0. Some offensive highlights include junior quarterback Jordan Vazzano’s impressive 210-yard passing performance, first-year running back Spencer Lockwood’s (Danielson, CT) 84 rushing yards in his collegiate debut, and all of senior kicker Eric Sachse’s (Jefferson, MA) successful five extra point attempts. On the defensive side, first-year linebacker Robert Levine (Catonsville, MD) recorded a game-high 12 tackles in his collegiate debut, while classmate Brian Casagrande (Madison, CT) had nine tackles. Max Chipouras was honored NESCAC offensive player of the week for his outstanding performance. It is clear that Trinity continued their momentum from 2017 into last Saturday’s match-up. This Saturday, the Bantams bring their talents to home turf at the Jessee/Miller Field against Bates.